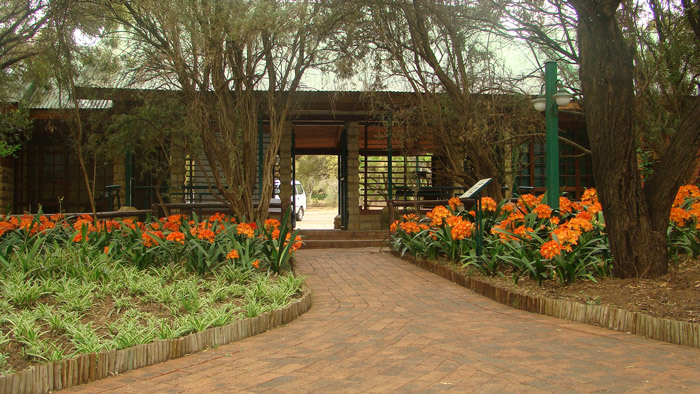 With its interesting collection of indigenous plants that are representative of South Africa’s Free State Province, its winding pathways, various demonstration gardens, and extensive network of walking trails, the tranquil setting of the Free State National Botanical Garden is a wonderful place to relax and spend quality time with family and friends. The Free State National Botanical Garden is one of the 10 National Botanical Gardens managed by the South African National Biodiversity Institute (SANBI). The garden is the most central national botanical garden in South Africa, located in the northern suburbs of South Africa’s judicial capital, Bloemfontein, in the Mangaung (meaning the ‘the place where cheetahs dwell’) Metro Municipality. Bloemfontein, popularly known as the ‘City of Roses’, also serves as the capital city of the Free State Province. It is within a 130km radius of Kimberly, the Free State Goldfields and Maseru, Lesotho. The garden has a distinctive topography, consisting of dolerite kopjes separated by valleys and dry watercourses, and a wetland area associated with river and dams. The garden was officially opened on 22nd February 1969 by the Hon. Jim Fouche, then State President. Since this time it has been used extensively for research purposes by university students, schools and ecologists, and also visited by nature lovers who come to stroll and enjoy the plants and bird calls in the peaceful setting. 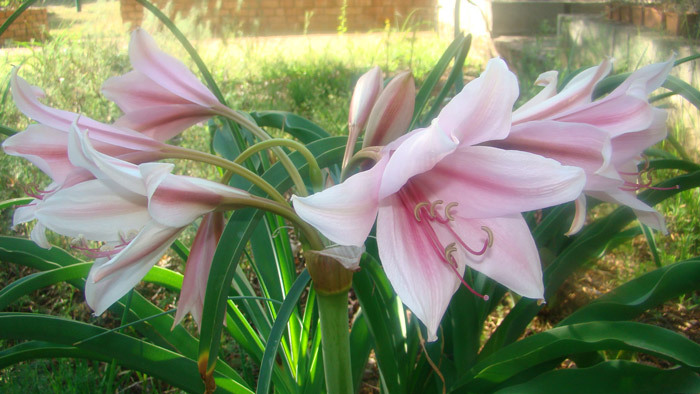 The Orange River lily is the provincial flower of the Free State. The bulbs remain dormant underground during the dry, cold winter months enabling the plant to survive the severe frost conditions that are often experienced in the Free State during this time. Come and enjoy the garden with family and friends, and discover what nature has to offer. It is indeed a garden for all seasons, but the garden is at its best from October until April, when many plant species, such as clivias, are in full leaf and in bloom. 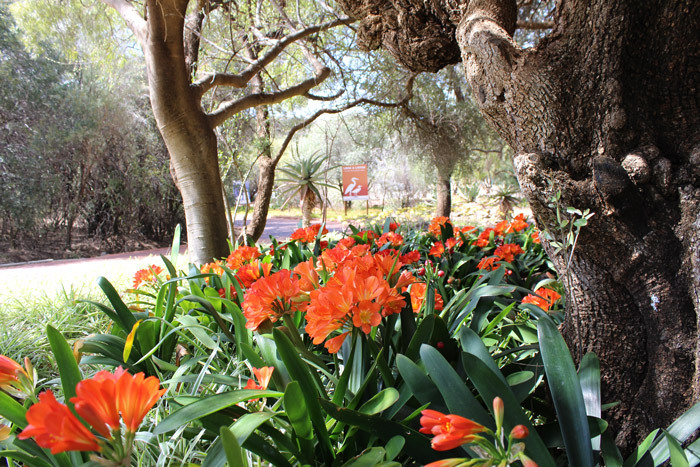 However, there is always something of interest, even in mid-winter when the vivid red and orange of the aloes stand out against the background of faded dry grass. At this time many of the trees are in fruit, with branches of bright orange fruits attracting plenty of birds. Many birds eat the berries produced by some plants, while others are attracted by insects living on the plants. Clivias, also referred to as bush lilies, have heads of brilliant orange (rarely yellow). These trumpet shaped flowers appear mainly in spring but also sporadically at other times of the year. The deep green shiny leaves are a perfect foil for the masses of orange flowers. 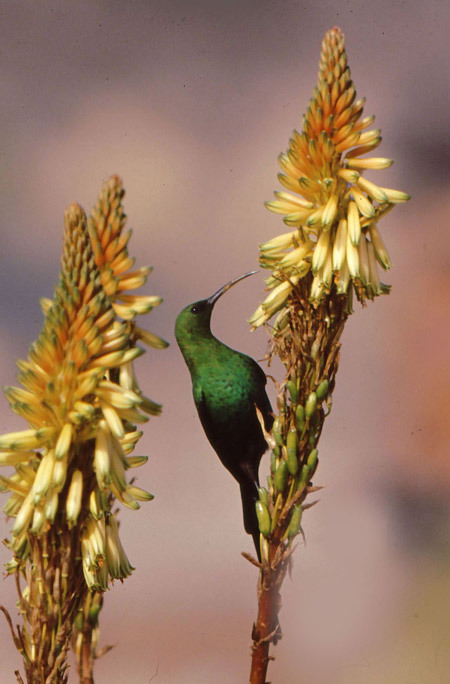 In the hilly natural areas of the Free State National Botanical Garden the nectar-rich aloes that flower in winter and early summer are visited by brilliant sunbirds. Aloes not only provide nectar, but also lend striking colour to a tired looking winter garden. Sunbirds are unlikely to visit unless you have nectar plants. In the hilly natural areas of the Free State National Botanical Garden the nectar-rich aloes that flower in winter and early summer are visited by brilliant sunbirds like this malachite sunbird. The Free State Garden is certainly a unique garden in South Africa’s network of national botanical gardens as it is exposed to seasonal climatic extremes, including periodic droughts and floods. We encourage all visitors to walk the two beautiful Motshetshe and garden view trails, which will show you the beauty and diversity of our Free State plants. Both trails are approximately 2.1km long. They offer magnificent views and can be tackled with vigour or simply enjoyed at a leisurely pace. An interpretive trail known as the Motshetshe Trail, named after the mountain cabbage-tree, Cussonia paniculata, which dominates the south-facing slopes, has been laid out along the main kopjes in the garden. It also features evidence of the early dwellers of Basotho people in the area, where stones and pot fragments have been discovered. Guided tours of the garden, including a dedicated tour of the medicinal plants garden and the succulent plants garden, which introduces visitors to some of the succulents found in South Africa’s nine provinces, can be arranged by contacting the admin office of the garden. 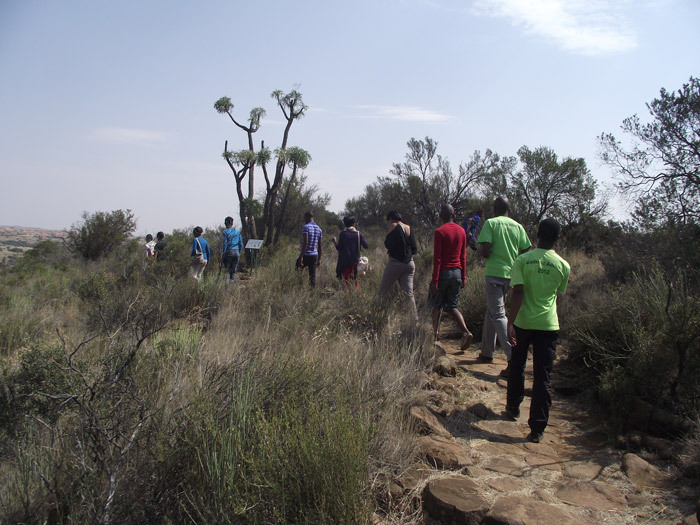 We encourage all visitors to walk the two Motshetshe and garden view trails, which will show you the beauty and diversity of our Free State plants. The garden view trail takes visitors all the way up to a lookout point where one experiences great, majestic views of the garden. This trail is unique in its species diversity, which includes a wide range of bird species and several fascinating plant species. Birdlife is abundant due to the diversity of habitats (grasslands, bush, scrub and water-rich areas) in the garden. The local bird club has recorded over 151 bird species and visitors can spot several species and hear a number of different bird calls. Bird baths and ponds have been placed in various parts of the garden to attract birds. Animal life is not abundant but some of the small mammals occurring in the garden include yellow mongooses, hares, dassies, mice, wild cats, caracals and small grey antelopes. 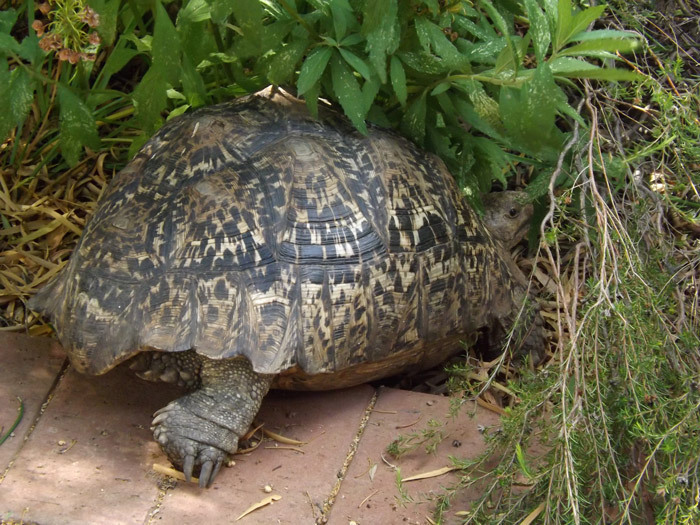 Reptiles, although not often spotted, occur in the garden including tortoises, cape cobras and puff adders. 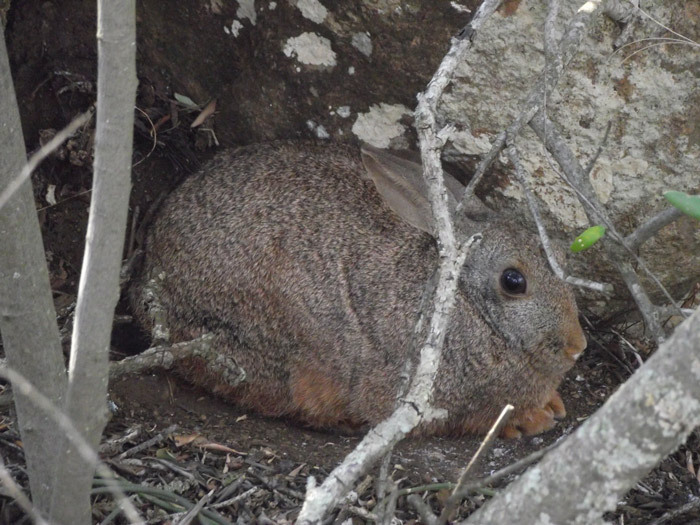 Animal life is not abundant but some of the small mammals occurring in the garden include hares, yellow mongoose, dassies, mice, wild cats, caracal and small grey antelope. 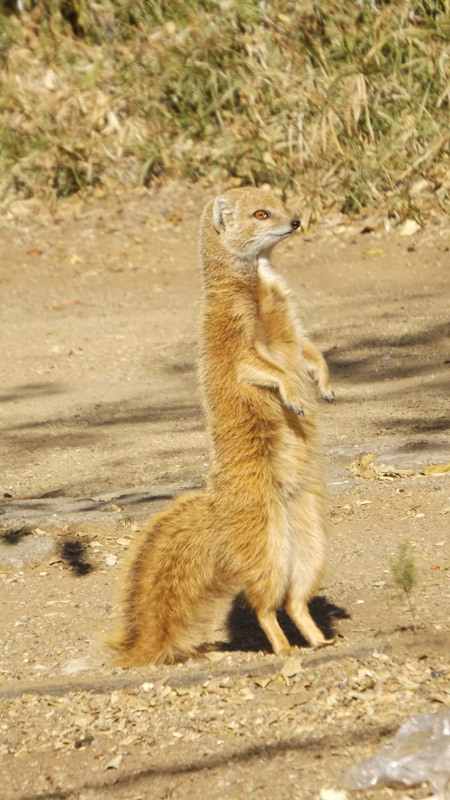 The yellow mongoose has five digits on the forefeet and four digits on the hind feet. The front feet have long curved claws that are used for digging. They are predominantly diurnal, being active during daylight and retreating to burrows at night and in extreme weather. The leopard tortoise has a life span of 50 years or more, and is a solitary reptile that spends most of their time grazing on fibre grasses and greens. On average, they are about 40-50cm long and weigh 18-23kg. This reptile is brown and yellow in colour. It is found in the savannahs of eastern and southern Africa, from Sudan to the Southern Cape. You may not get to see a group of these guys but you could see the same one over and over again throughout your lifetime. When next travelling through or via Bloemfontein, set aside some quality time to visit and explore this fascinating garden, with its associated wildlife, that has been developed, nurtured and enhanced by dedicated staff for more than 46 years. Take time to look around and get connected with your surroundings. The garden offers so much more than meets the eye; there is plenty to see and learn if you are prepared to explore. 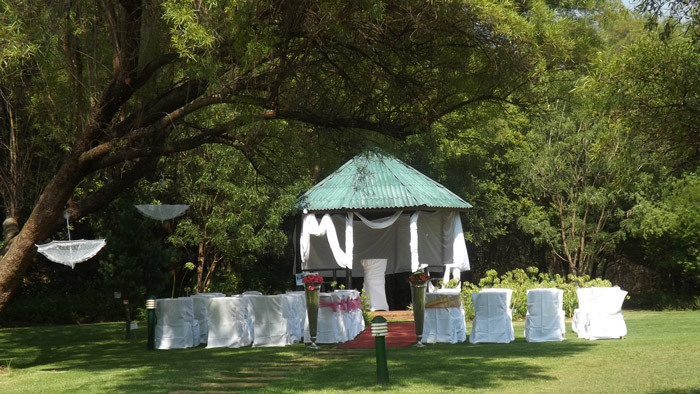 The garden gazebo nestled in the peaceful and beautiful surrounding of the garden offers a perfect, affordable sanctuary for romantic wedding. Botanical Society of South Africa members enjoy the benefit of free entrance into all SANBI gardens amongst other great benefits. Becoming a member is easy, sign up here and know that your membership not only gives you great opportunities but contributes to conservation, environmental education and awareness, and helps the upkeep for our treasured SANBI National Botanical Gardens. You can also support the Botanical Society by making the Botanical Society your selected beneficiary on your MyPlanet card.